There is something very interesting going on with audio and visual. On-demand audio streaming is growing by leaps and bounds. Perhaps most interesting is the fact that people are more likely to listen to audio than they are to watch video during the week. I guess that makes sense. Why? Because when you’re listening to something you’re free to do something else. You can listen to music or a podcast or the radio while cooking, driving, working, etc. You can’t do that with video. Video requires all of your attention unless you’re only listening to the audio from the video. Audio content is becoming easier to consume. Smartphones make it easy to listen to on-demand audio anywhere and at anytime. If you’re one of the few holdouts from listening to podcasts chances are good that you will be listening to podcasts in the coming months. Consumer attention is with audio right now and it’s going even more in that direction in the future. If you want to market better in the future you’ll need an audio strategy. Here are some tips for local businesses in regards to audio. The best place to start is to answer the questions your target customers are asking. If you’re a B2C, focus on the questions your customers are asking about their general life. Their hobbies. Their interests. These could be about your product and service. But instead of answering on specific questions like, “What does it cost?” focus on questions like, “What are some fun things for families to do on the weekends?”. It may seem general, but when you’re marketing the odds are good that your customer doesn’t know you exist. You have to enter their attention realm. If there attention is on a topic you have to enter that topic. Interviews have always been a great form of content for a few reasons. First, if you feel that you’re not an expert on a topic and you don’t have time to do the research you can find an expert and interview them to get great content. Second, the expert likely has an audience and their involvement in your content will likely increase its exposure. You’ll see local radio shows doing this all the time. They’ll interview local experts like mechanics, wedding planners, real estate agents and more. 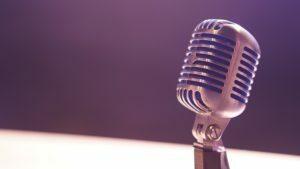 You can act like the radio station and host the local experts on your podcast. These might be short, but they could also be long. Maybe you know some stories about your local area. You don’t have to be the only one that knows. Even if the story is common knowledge you can still provide a service by recording it and publishing it as a podcast. Local legends. Local sports heroes. History lessons. It’s great to have text reviews on your site and online in places like Yelp and Google. You definitely still want those, but now it’s also valuable to have audio customer reviews. This way people can listen to reviews about your local business while they’re doing something else. They don’t have to take their entire attention away from what they’re doing to read them on your website. Instead of closing your website and forgetting about you because they have a meeting they can save the reviews in podcast form and listen to them all later when they’re making dinner for their family. This has been a great form of blog post for many local businesses. Even a local dentist can do a local news and events roundup. The dentist’s patients are probably always looking for local information like what’s going on and what there is to do. Still write the blog posts or email newsletters, but also read the content, record it and publish it as a podcast. This way your customers can listen whenever they want on demand. Audio is going to be one of the big changes in marketing in the next few years. These are just a few ways local businesses can take advantage. There are other ways, but I would start with these to get your feet wet.